This page is about the Japanese fighter A7M2. For premium version, see A7M1 (NK9H). The A7M2 Reppu is a Rank III Japanese fighter with a battle rating of 4.3 (AB), 5.3 (RB), and 4.7 (SB). 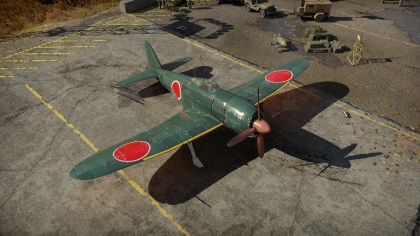 This aircraft was introduced in Update 1.55 "Royal Armour". 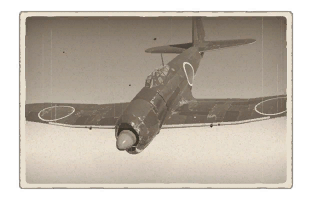 The A7M Reppu was designed to be an improved version of the famed A6M Zero fighter, and as such, retains some of its legendary older brother's characteristics. The Reppu is an overall smooth operator at most altitudes thanks to its decent acceleration, vastly improved speed and amazing manoeuvrability. While less manoeuvrable than the Zero, it will still outmanoeuvre most opponents with flaps deployed, so players who liked the Zero will feel right at home. The most noteworthy change is the replacement of the underpowered Nakajima Sakae Radial engine with a significantly more powerful Mitsubishi Ha-43 Radial. This new engine propels the Reppu to higher speeds previously unobtainable by the Zero and turns this aircraft from a nuisance to a universally feared opponent. While being slightly more durable than its older brother, the Reppu is still very vulnerable to any kind of battle damage. Anything with greater than .50 calibre weapons will be able to take off a wing or worse. The wingspan has also increased significantly to keep the manoeuvrability of the Zero while supporting increased weight added from the guns, engine and other updates. A downside is that this makes the wings easier to hit. However, The manoeuvrability of the Reppu allows this aircraft to avoid most damage if you can keep turning. The A7M is played almost exactly like the Zero, but with a few changes due to the good performance. Due to its high top speed (for an IJN plane at least) and good dive speed, it can tailor to any form of dogfighting. It can turn fight, energy fight, Boom-&-Zoom and others. It is mandatory to keep your energy up at all times, as you can suitably engage opponents in multiple ways by doing so. Keep your speed at a medium and maintain altitude. A low flying Reppu is an easy prey for diving Americans and Russians that dive on you. However, you can pull rolling manoeuvres to avoid their strafe or turn as soon as they get within range. This page was last edited on 7 April 2019, at 05:43.